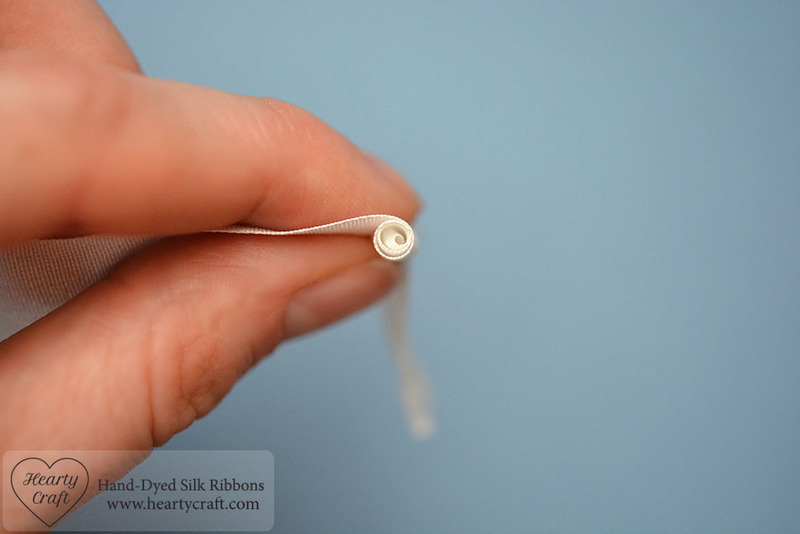 Today I’d like to share a simple and very popular technique for folding silk ribbon to make a rose. 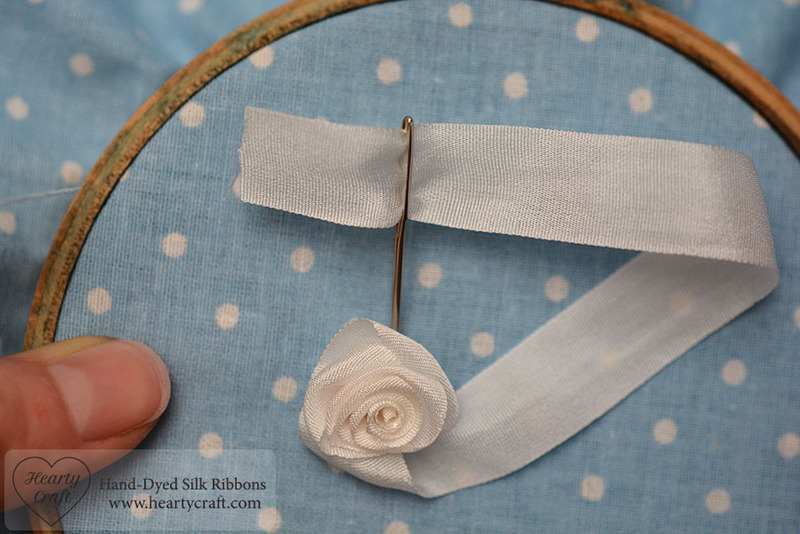 Quite a lot of roses on silk ribbon embroidery pieces you’ve ever seen are made using it. The technique is called, unimaginatively, the Folded Rose. 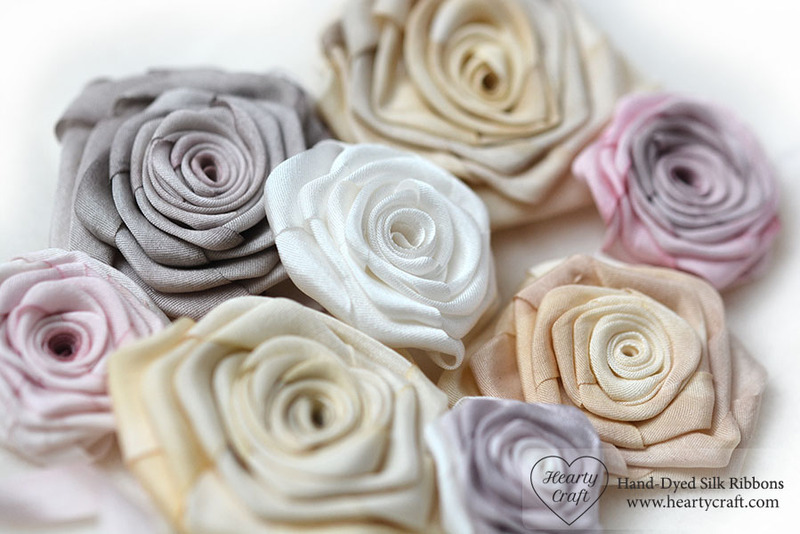 Any silk ribbon from 7mm and wider generally can be used for folded roses. 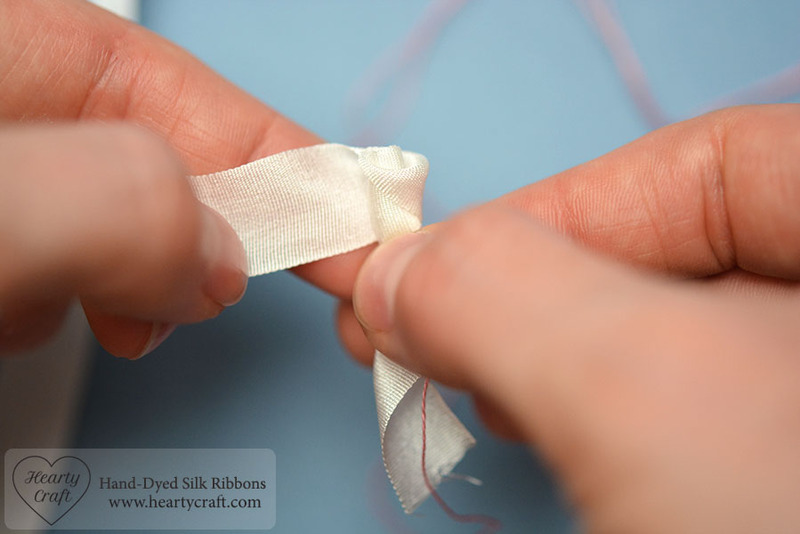 It is possible to do so with narrower ribbon, but it gets quite fiddly. A lot of patience advised if you do that. I am using a wider ribbon to make it easier to follow. 1. 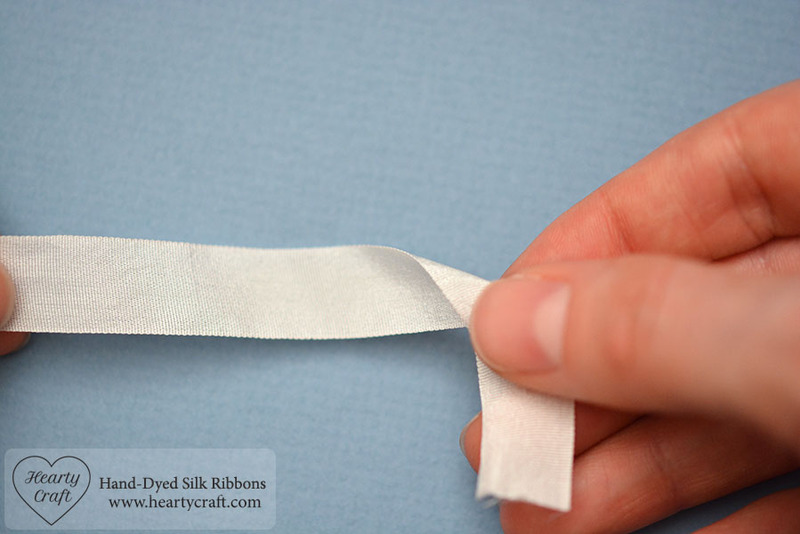 Take a piece of silk ribbon and fold over its right end. This short tail will help to handle your future rose as you work on it, and will be cut off later in the end when the rose is ready. 2. Holding firmly the short tail between the thumb and index finger of your right hand (assuming you’re right-handed) start rolling the fold with the tail towards your left hand. 3. Keep rolling until you make three turns to form a centre of the rose. Make more turns if you need a bigger centre. 4. 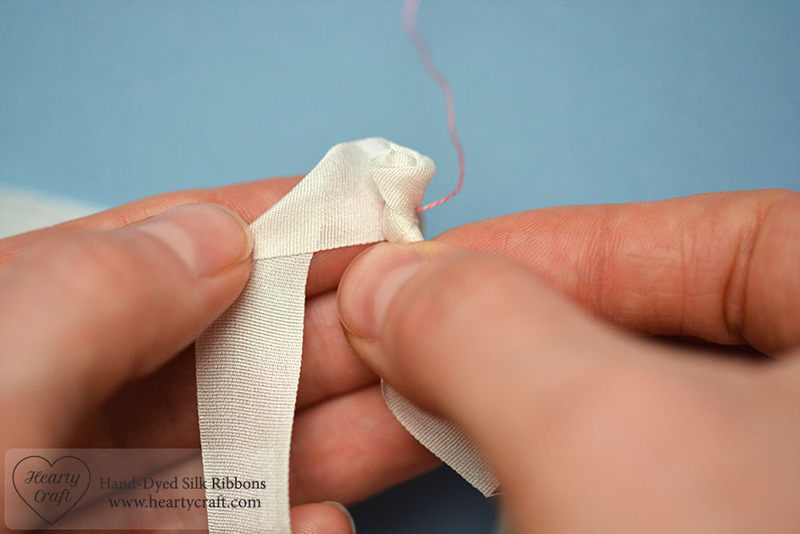 Now take a needle with a matching floss and fix the centre with a few tiny stitches. Do not cut the floss off afterwards, leave it hanging freely. 5. 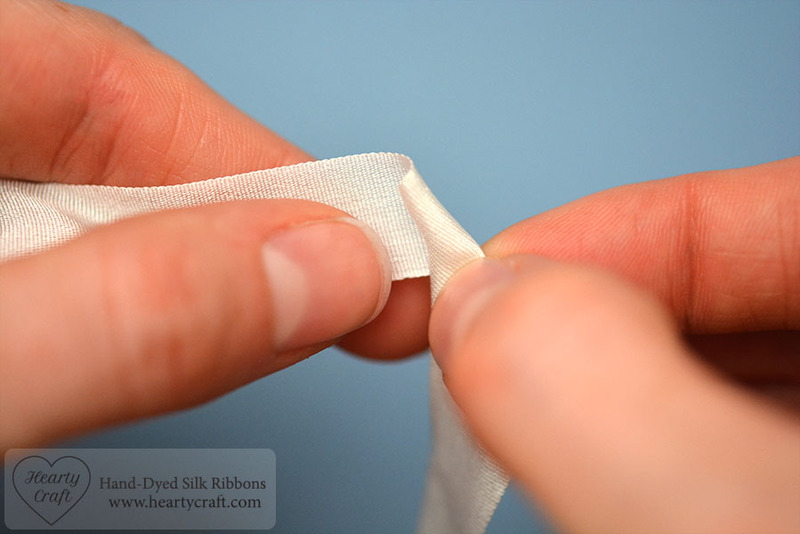 Holding the tail in your right hand fold the ribbon back and down with your left hand. 6. Wrap the fold around the centre of the rose to form a petal. 7. 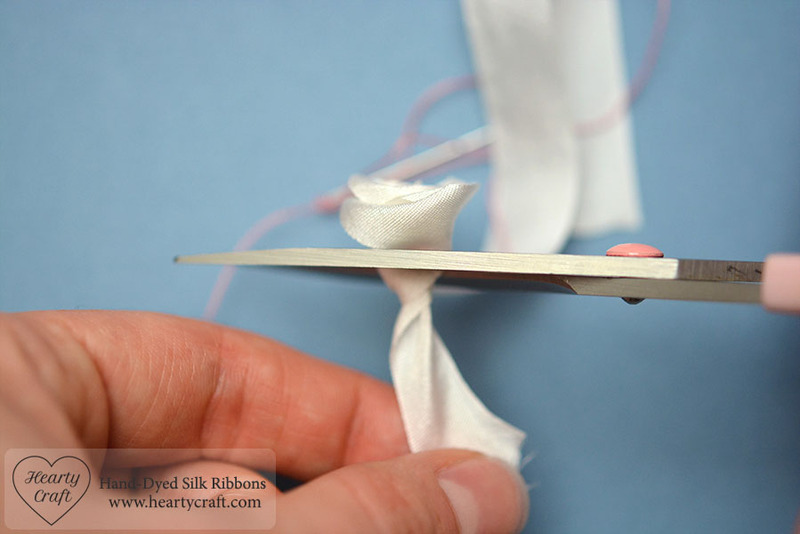 Secure the petal with tiny stitches. Do not cut the floss. 9. 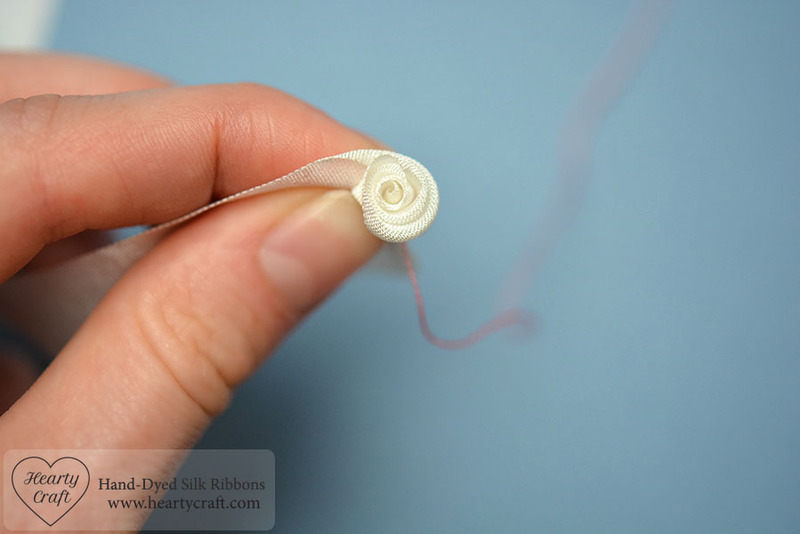 Keep forming petals and securing them with tiny stitches until you reach a desired size of the rose. 10. Secure the last petal, but still do not cut the floss and the ribbon. 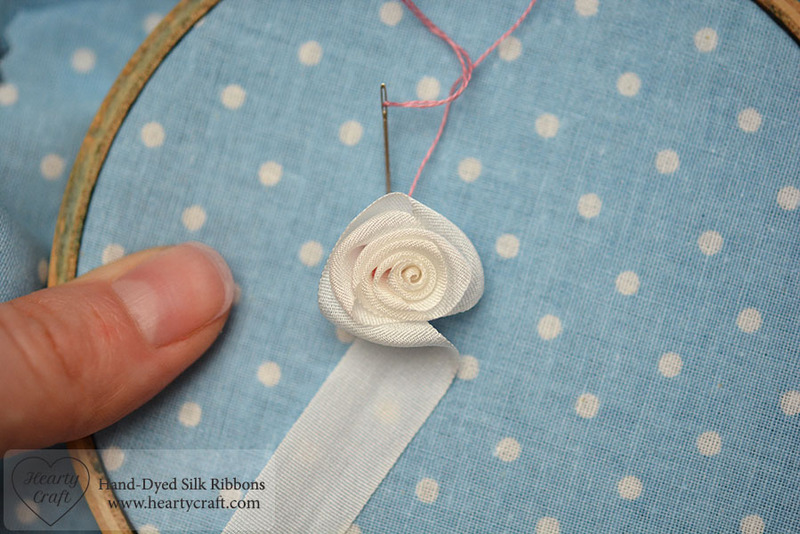 Using a pair of scissors trim away the tail close to the base of the rose. 11. 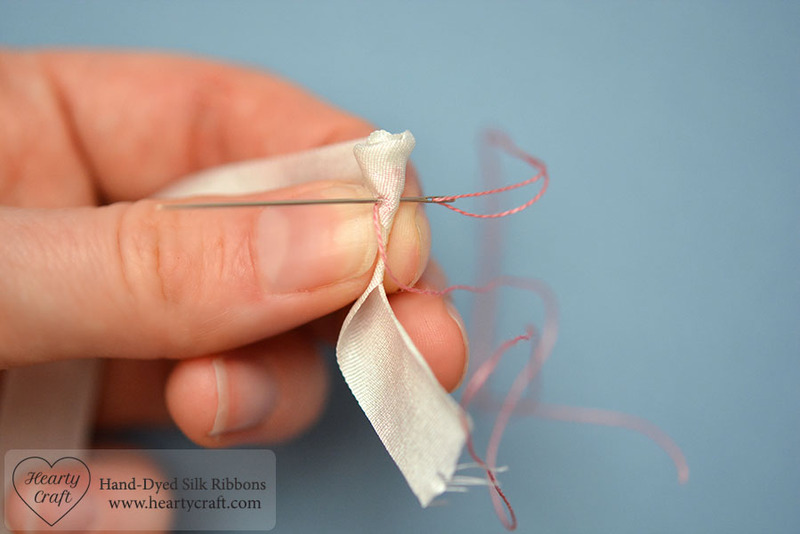 Attach your rose to the fabric, using the floss that is left after securing the petals. End off the floss. 12. 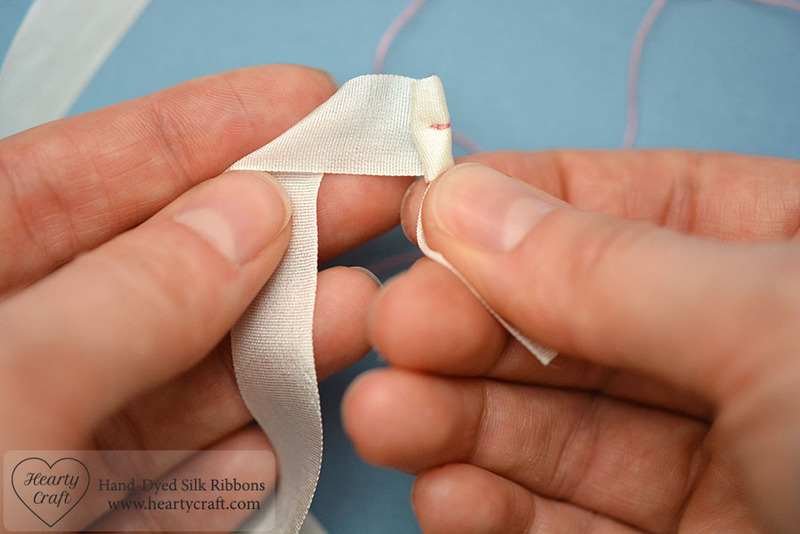 Thread the ribbon, and bring it to the back making a straight stitch close to the base of the rose. 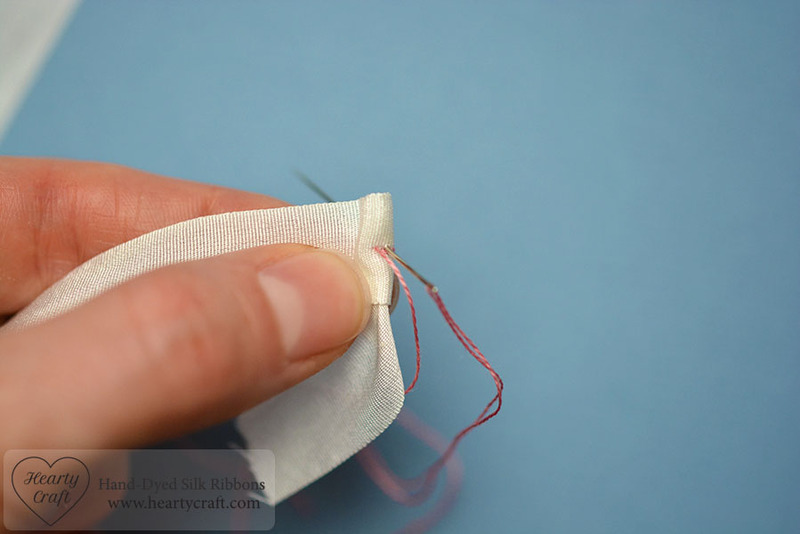 Use this stitch to cover any visible stitches made with floss earlier. Secure the ribbon at the back. 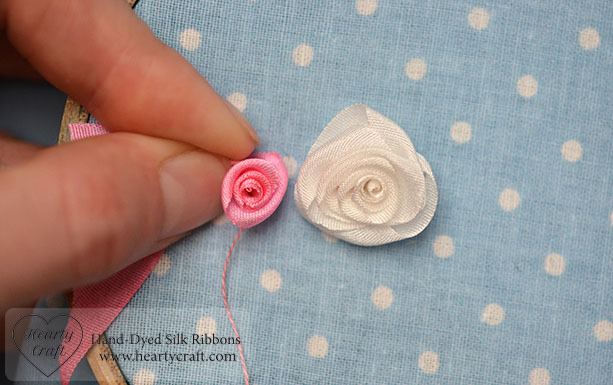 Here are two roses different in size that are made using 7mm wide silk ribbon (left) and 13mm silk ribbon (right). As you see the size of a rose depends on how wide the ribbon is. For even larger roses use 32 mm wide ribbon. This entry was posted in Blog Posts and tagged How to, Roses, Silk ribbon embroidery, Tutorial on 30th July 2015 by Zinaida. Thank you so much for your demo. Just what I needed for me new dress.